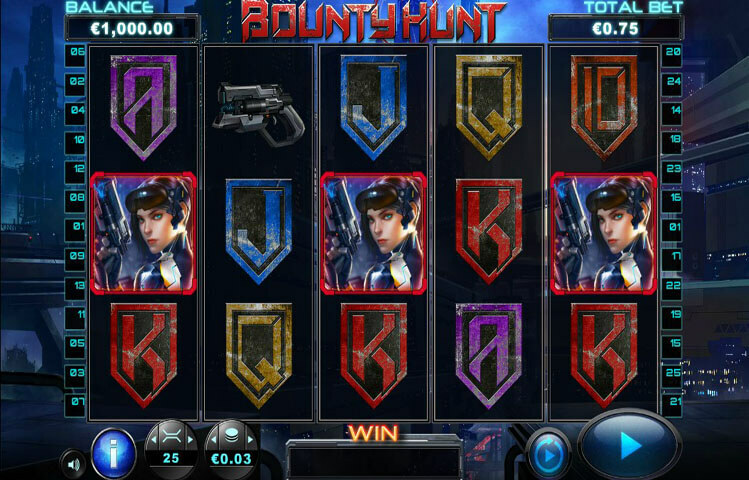 Bounty Hunt is a 5 reel, 25 line video slot machine. The slot is a result of a marvelous cooperation between Chance Interactive and Next Gen Gaming. The game has a sci-fi and a futuristic theme that will immerse players in a highly exciting and a rewarding experience. The game has plenty of bonus features and winning chances. For example, there is the Crosshair wilds and a free spins round. Bounty Hunt is offered to players in amazing visuals, which are accompanied by equally outstanding sound effects. So players better be ready for a one of a kind experience that will always have them coming back for more at Bounty Hunt. Bounty Hunt invites players to join Kat Lee, the futuristic law enforcer and bounty hunter. They will join her as she tries to bring the fugitives down and to serve them to justice. So players can enjoy an action packed experience that will take them to a futuristic setting. They will not only get to enjoy this marvelous experience, as they would also be able to claim plenty of rewards. They can claim these rewards through the 25 lines of the game. Players can also claim these rewards with the help of the wild and the bonus features of the game such as the Free Spins round. Players can enjoy the adventure with ease as the control panel is user-friendly and easy to use. It is where players can control the game play. It is where they will spin the reels, use the auto play function, place bets and more. The reels of the game are set in a dark cityscape with various spaceships that are found in the backdrop of the reels. The symbols appearing on the reels of the game include grenades, guns as well as the three villains that the bounty hunter is trying to catch. These three baddies are Hank Blade, Dr. Fury and Big Boss. Of course, since the game is all about Kat Lee the bounty hunter, she is the highest paying symbol. This is because 5 of these icons on the same line would give players 250 coins. Lastly, there are the low paying icons, the card symbols. There is a fluorescent colored blue crosshair that would glide across the reels of the game during each spin. If this crosshair lands on one of the playing cards, it will turn it wild. If it lands on a gun, it will turn it, and another random symbol into wilds. If it lands on the Big Boss, the big boss will turn wild, and all other instances of that icon would turn wild as well. This is why this feature is one of the most rewarding features that this game has to offer.